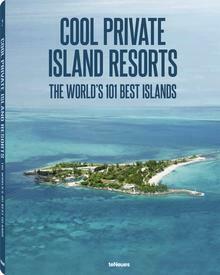 Most people with a private isle to call their own can’t help but feel like ‘lord of the manor,’ but in the case of the owners of tiny Towan Island, it’s not just a metaphor. The Telegraph UK newspaper has published a fascinating interview with Lord and Lady Long, who own Towan Island on the sunny shores of Cornwall. 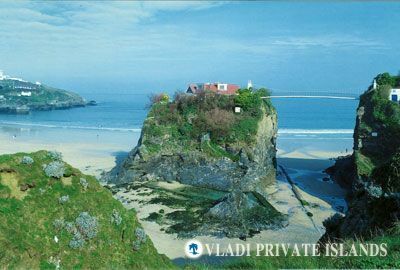 A spectacular landmark on the coast of Newquay, a popular spot for summer surfing, the island hosts a charming Edwardian-era home and connects to the mainland via a truly unique 100-ft long suspension bridge; a heart-stopping 70-ft above the ground, the bridge was built as the main entry point to the island in 1902 (but of course, remains very well-maintained). The interview gives an exceptional look into the lives of Lord and Lady Long, who purchased the island eleven years ago after selling their Hertfordshire castle. While driving to Scotland, an advertisement in Country Life magazine caught their eye, and they transformed the island into a peaceful hideaway from the world. Looking out onto Cornwall’s long stretches of sandy beach and endless ocean, the home sits perched atop a high rocky outcropping, with a small footbridge – perhaps the UK’s only privately owned example – leading straight from the home’s door to a nearby cliff. 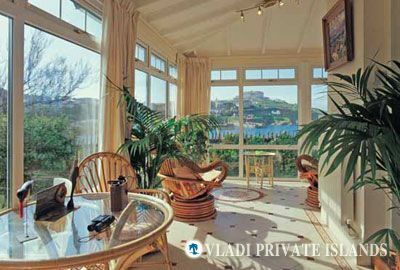 In other incarnations, the island has been home to an art gallery and a tea house, and has had no shortage of illustrious visitors in its history, including Conservative MP Ann Widdecome and (reportedly) Sir Arthur Conan Doyle. Perhaps the most eager guests, however, are the grandchildren of the owners, who adored their summer visits. The island is not the most practical of properties, though, and as Lord Long is now an octogenarian, the couple have decided to see their beloved island, but not without a wistful element of sadness.